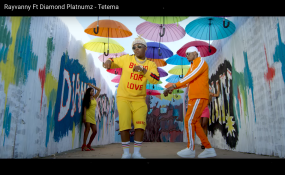 Tanzanians singers Diamond Platnumz and Rayvanny have reawakened the raging #PlayKeMusic debate with their new hit song titled Tetema. It all started when a tweep who goes by the name Njiiru posted a short video of the song, which is probably on the playlist of most of the fans of the bongo stars, for its compelling beats. Njiiru commented that with the good execution of the song, playing Kenyan music will be much harder now. "nikama play Kenyan music hii mwaka pia haitawesa," tweeted Njiiru. The video of the song released on Wednesday this week already has more than one million views and is number one trending on YouTube. As usual Diamond and Rayvanny were at their element with the production of the song that is already a club banger. Kenyans on Twitter joined in the conversation and this is what they had to say. Khatendesi Shitienyi said, "Tangu hiyo hashtag iwekwe wajinga hawajatoa ata Ngoma mmoja mpya mzuri, TZ are already on sijui number 5!" Sammy Safari agreed, "Sioni hii mwaka ikiweza Walai." Liberal Rebel asked, "How will they compete against this?" Laika commented, "I can name a hundred Kenyan artists who are better than this." Blaze Tonee said, "We need to change the face of Kenyan music diamond did it and he made it in very harsh conditions. We need to emulate not hate." Joan said, "And we are not about to play them anytime soon, Tutatetema adi 2019 iishe."